"Putting texts on rounded shapes and arranging partial circle sections in a nice way was too much for all vector and diagram drawing applications I tried." looks like something that could be useful when added to another application, krita or kpresenter maybe? @smls: Inkscape was much less advanced and had a lot less helpful tools back when Archibald was written. I think this misses the point, however. What I really like about Archibald is that it was created to solve a very specific problem. Sometimes the worthiness of a piece of software is not measured in its utility or in the amount of alternatives already in existence. 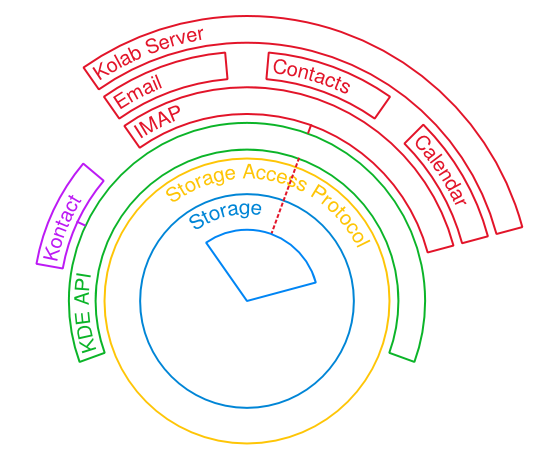 At the Kolab section, shouldn't the IMAP layer be closer to the Kolab layer, i.e. its position exchanged with the ones of "Email", "Contacts" and "Calendar"? I must as well reply that Inkscape could do that now. But as well mention, maybe not 5 years ago. 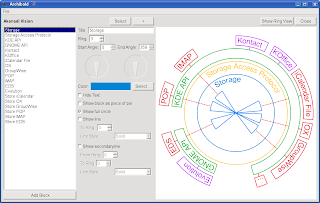 But the point still stands, that is good looking diagram and a standalone application for it is such what really is easier to use when wanted to make same kinds without SVG/Image editor. 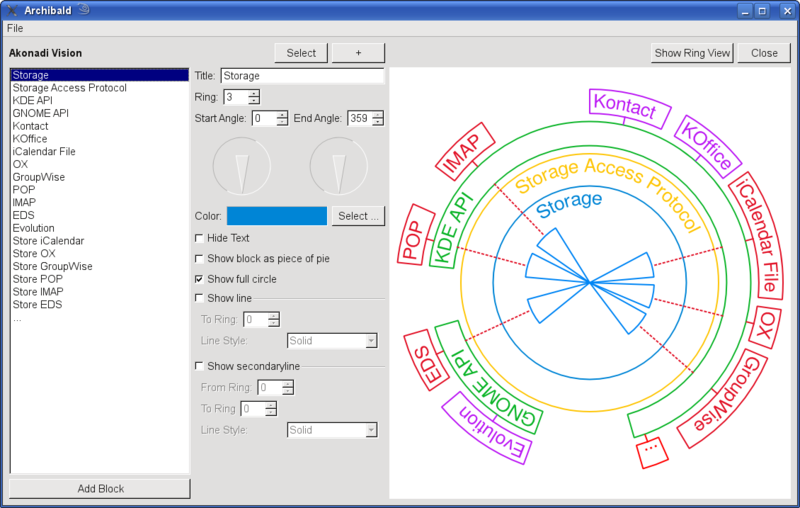 As that standalone application seems to allow easy way to edit the diagrams as well. Even that pie charts are hard to read and they actually have fault to give inaccurate graphical information, that would work on many other situations as it is layered pie. Any plans for a repository on the openSUSE Build Service? It would be nice if I'd be able to pull Archibald in from a repo. 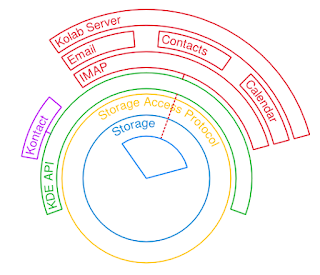 @smls: I tried Inkscape and actually was able to create the diagram. But maintaining it was still quite painful, moving around blocks in a consistent way, etc. That's way simpler with a custom app. @Fri13: The code is hardly ready for KOffice inclusion. It's really very specific to the use case. @Gábor: Yes, would be great, and probably is really simple, as Archibald is a straight-forward qmake project. Do you want to give it a try to package it? @Kevin: I guess you are right. You could check out the Archibald code, do the changes, and submit a patch. Should not take much more than ten minutes. Would you be willing to give it a try?